The cryptocurrency markets saw massive movement on Sunday night, with most of the top 20 cryptocurrencies gaining in value. Of the top 20, BCH saw the biggest gains, going up by almost 21% in trading. The world’s fourth most valuable cryptocurrency went from $473 at the start of the trading day to as high as $573 per token. The price of Bitcoin Cash is currently $545.28 per token at the time of writing. In the last seven days, Bitcoin Cash has gained about 30% since the world’s second largest cryptocurrency exchange, Binance, announced its support of BCH’s upcoming hard fork. To find out more about the story click here. The technology giant International Business Machines (IBM), popularly known as Big Blue, has applied for another patent. This patent aims at preventing AR (augmented reality) players from entering undesirable locations. The patent, released by the USPTO (US Patent and Trademark Office) on Thursday, November 1, describes a system based on Blockchain that would set up and maintain safe boundaries between augmented reality objects and real-life physical locations. This new system would create a distributed ledger that would maintain a continuous and growing list of data records that would be protected from any alterations or even forgery. Find out more about the story here. China’s central bank, PBoC (People’s Bank of China), is planning to clamp down on airdrops. Airdrops are the free distribution of cryptocurrency tokens. According to PBoC’s 2018 financial stability report, which was released last Friday, airdrops and other “disguised” ICOs (Initial Coin Offerings) were continuing to grow in number, despite the government’s attempts at stopping the sale of tokens. The report stated that many crypto firms had moved their projects abroad and were using agents who were investing in cryptos on behalf of their clients in mainland China. The bank also stated that firms had created another form of fund raising by using airdrops, wherein they depended on secondary markets to help push up the prices of their tokens so that they could make a profit. Read the details of the report here. The current capitalization of the cryptocurrency market is $211.90 billion, while its current trading volumes are at $14.56 billion. In the last one day, the price of Bitcoin has gone up to $6467.15, a 1.41% increase in its token price. 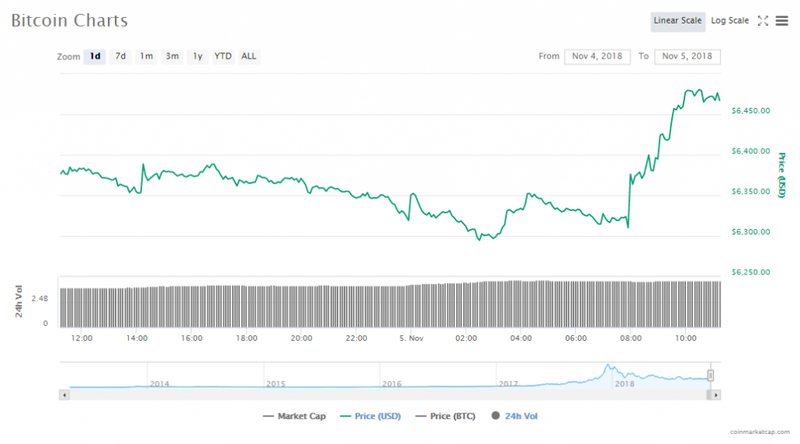 The crypto’s market value is currently at $112.07 billion and its volume of trade is at $4.38 billion. The price of Ethereum is currently $208.87, which is a 4.55% jump since the same time yesterday. 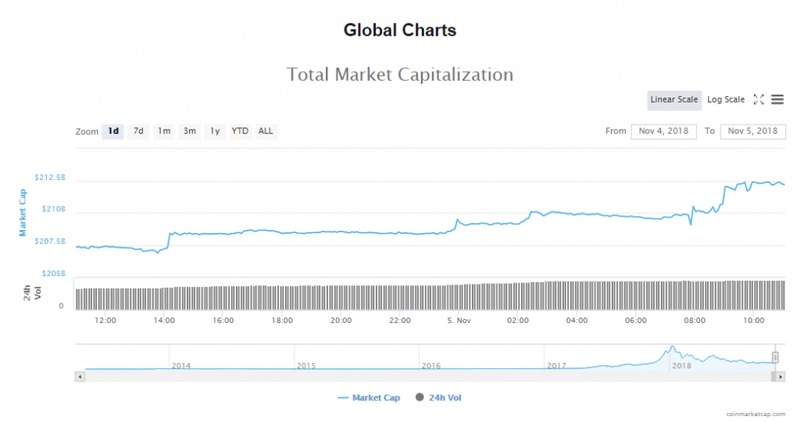 The crypto’s current market value is $21.48 billion and its trading volume is at $1.78 billion at the moment. The cryptocurrency market’s top ten most valuable digital assets by capitalization all saw gains in the last 24 hours. These gains were led by Bitcoin Cash, which is still up by 8.14%. The other two front runners in the cryptocurrency market ae Litecoin, which is up by 4.58% and Ethereum, which has gained 4.55% in the last 24 hours. Bitcoin is trading at $6467.15, increasing by 1.41%. Its worth is $112.07 billion. Ethereum is trading at $208.87, increasing by 4.55%. Its worth is $21.48 billion. Ripple is trading at $0.462194, increasing by 2.24%. Its worth is $18.58 billion. Bitcoin Cash is trading at $545.01, increasing by 8.14%. Its worth is $9.50 billion. EOS is trading at $5.48, increasing by 3.30%. Its worth is $4.96 billion. Stellar is trading at $0.241908, increasing by 2.01%. Its worth is $4.57 billion. Litecoin is trading at $53.34, increasing by 4.58%. Its worth is $3.14 billion. Cardano is trading at $0.074849, increasing by 4.20%. Its worth is $1.94 billion. Monero is trading at $110.40, increasing by 3.89%. Its worth is $1.82 billion. 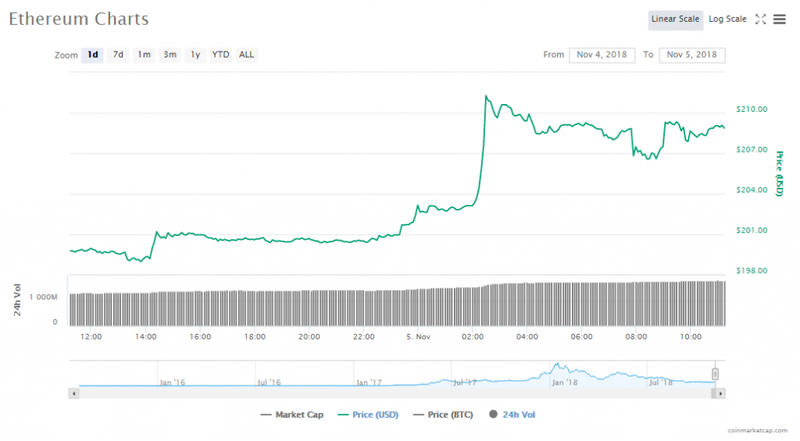 Tether is trading at $0.991542, increasing by 3.89%. Its worth is $1.76 billion. The Winklevoss-owned Gemini crypto exchange is adding support for Bitcoin Cash (BCH). Specifically, the New York-based startup is only supporting the fork of the cryptocurrency based on the Bitcoin ABC roadmap, and not the alternative version, which “Satoshi’s Vision” (SV). Bakkt has raised $182.5 million to build out its global digital assets platform and bitcoin futures product. The round, which is the company’s first, included 12 partners. The crypto startup is owned by Intercontinental Exchange (ICE), which is best known as the parent company of the New York Stock Exchange (NYSE).